Blurb: Princess Alyrra’s strength lies in silence. Scorned by her family, she avoids the court, spending her time with servants. When her marriage is unexpectedly arranged with the prince of a powerful neighboring kingdom, Alyrra feels trapped. As the court celebrates her match, dark rumors spread about the unexplained deaths of the women of her new family. Alyrra begins her journey with mounting trepidation. Betrayed while traveling, she seizes an opportunity to start a life away from court. I reach to scoop up more water from the river and then pause, staring. There is something odd about my reflection but I cannot make out what, for the water does not run smoothly but in ripples and eddies. I dip my fingers in, breaking the image. But it does not break. A hand reaches up and closes around my wrist. I choke on a cry of terror, jerking away, but it pulls down—hard—and I lose my footing on the muddy bank, falling headfirst into the rushing waters. The world is strange, blunted, beneath water. I twist, striking out, but cannot quite find my attacker. The hand still holds my wrist in an iron grip. I kick, desperately trying to tear myself away, push my way to the surface. The air burns in my lungs, spots dancing before my eyes. Something touches my throat—a knife? I flail away from it, feel a slicing pain, and abruptly I am released. I find myself on my hands and knees, coughing up water, gentle waves lapping around my chest. I look up in terror, my hair sending an arc of droplets flying over the quiet waters. The river runs clear. But the birds are silent. 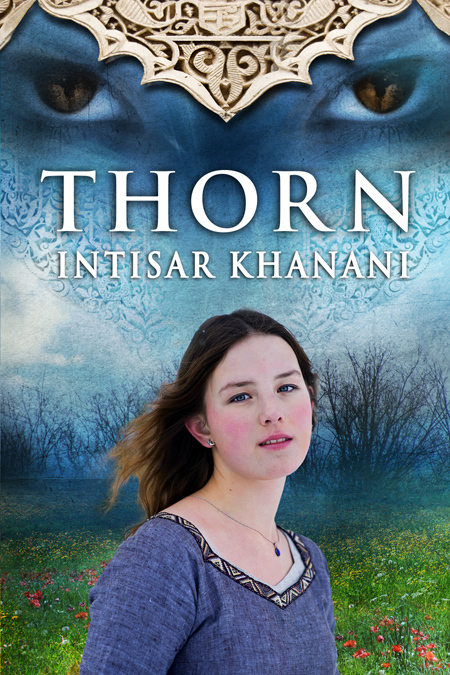 About the author: Intisar Khanani grew up a nomad and traveler. Born in Wisconsin, she has lived in five different states as well as in Jeddah on the coast of the Red Sea. She first remembers seeing snow on a wintry street in Zurich, Switzerland, and vaguely recollects having breakfast with the orangutans at the Singapore Zoo when she was five. She now resides in Cincinnati, Ohio, with her husband and young daughter. Intisar writes grants and develops projects to address community health with the Cincinnati Health Department, which is as close as she can get to saving the world. Her approach to writing fantasy reflects her lifelong passion for stories from different cultures. She is currently writing a trilogy set in the same world as Thorn. This is her first novel. The giveaway is is for a green fantasy cloak/cape made by the author herself. This contest is open to residents of the US/CA only. Enter below. This book sounds very interesting. I like the idea of the heroine fighting back against tradition and expectations. Thanks for the chance to win an awesome cape. I can use it when we go to the Renaissance Faire. Yep, Alyrra does fight back against certain expectations. A lot of what she struggles with is how to choose her own fate when so many of her choices have already been made for her. I think it's a challenge we all deal with to a certain extent, especially when we think about the social roles we're supposed to fill. 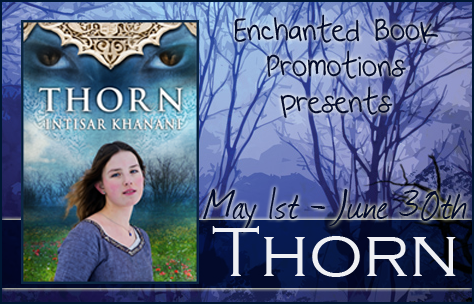 I hope you enjoy Thorn; I'd love to hear your thoughts on it! 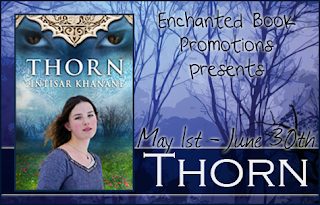 Thanks so much for featuring Thorn on your blog today. This book sounds very exciting. I would love to read this.